Do you know how Rudolph the Red-Nosed Reindeer first came to be? The lovable misfit reindeer was first created by Robert L. May, a copywriter for the department store chain Montgomery Ward, which published the story as a promotional booklet in 1939. May's brother-in-law was the songwriter Johnny Marks, who wrote a song about Rudolph that became a hit for Gene Autry in 1949 (he also later wrote "Rockin' Around the Christmas Tree" and "A Holly Jolly Christmas”). Marks' neighbor was Arthur Rankin Jr. (of Rankin/Bass Studios), who persuaded Marks to let him make a Rudolph TV special. Screenwriter Romeo Muller's script was based on the song, a format which became a staple of future Rankin/Bass specials, with follow-ups like "Frosty the Snowman" and "The Little Drummer Boy." Muller has said that he would have preferred to adapt the special from the booklet, but he couldn't find a copy. Rudolph the Red-Nosed Reindeer became the first and probably the most well-loved of all the Rankin/Bass’s many Christmas-themed stop-motion productions (fun fact: the animation technique is called Animagic, a painstaking process where jointed, wood-and-felt puppets were moved ever-so-slightly for each new frame. It took about 18 months to shoot a half-hour!). And for good reason - it’s been broadcast every holiday season since it first premiered in 1964! 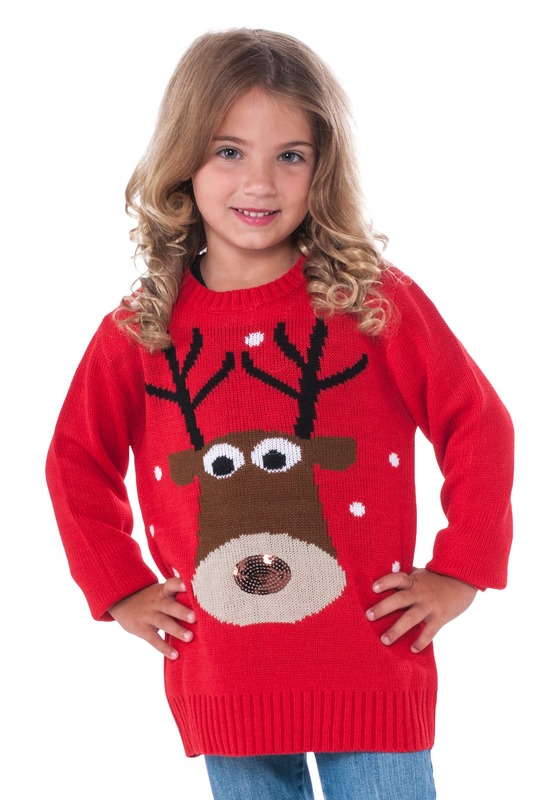 So if you love it as much as we still do and can’t wait to pass the beloved Christmas tradition on to the next generation, then this Child Reindeer Christmas Sweater is sure to be a hit! It’s perfect for your child’s ugly sweater parties this season (though if you ask us, it’s more adorable than “ugly”!) or for just hanging out with the family while you watch this year’s most beloved Christmas specials!